By grrlscientist on June 24, 2010. The World Cup and all the fanfare that surrounds it is truly amazing to experience. 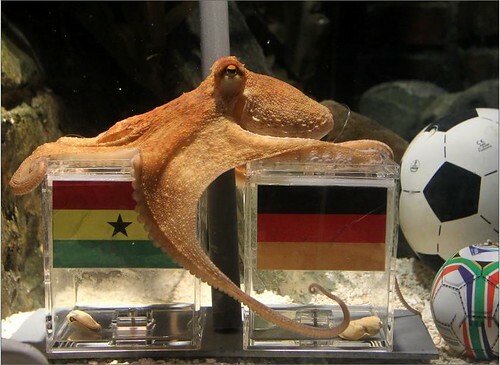 But perhaps strangest thing of all is that several zoos and aquariums in Germany have been asking some of their animals to predict the winners to the German World Cup matches. One of them, Paul, has distinguished himself by correctly predicting the outcome for all of Germany's matches so far. Paul the octopus lives in Sea Life aquarium in Oberhausen, Germany. He makes his predictions by choosing between one of two mussel-baited transparent cubes marked with either the German flag or the national flag of their opponent. The container that Paul chooses first is interpreted to indicate Paul's prediction for who will win the upcoming game. So far, Paul's predictions have been 100% correct: He correctly chose Germany over Australia on June 13 in their first Group D match, then chose the underdog, Serbia, over Germany, and yesterday, Paul correctly chose Germany to advance past Ghana and to enter the final 16. But Paul is not a newcomer to choosing winners for soccer/football matches. "For the European Championship in 2008 Paul had a success rate of more than 80 percent for the German games," stated Tanja Munzig, a spokeswoman for Sea Life in Oberhausen in western Germany where the eight-legged oracle lives. Interestingly, Paul was born at Sea Life in Weymouth, England -- and England also has a team in the World Cup. Paul the Octopus by Cuttlefish Poet. show the predition on every match. we want to know more predition by paul. These teams are strong with fantasies. Seeking methods to feel safe, that you are not sure, they are not alone. Germany is a strong team, but Argentina won this time. witchcraft can not be with the team of God. Remember, Where is God, there is no magic. Where is the world going to? "Remember, Where is God, there is no magic. This is true. The light of God bestow unto them the ability to understand. So, "magic" is no longer magical. "Magic" is simply a term used by those who do not understand the "mechanisms" yet. "In the latter days, people will decieve and will be decieved". These are all the manifestations of the end of time. No one but God knows tomorrow. Take it or leave. Whether the octopus is correct or not, it does not change the fact that God still reigns supreme. It might be an attempt on the part of the devil to further dissuade people from the fact that God exists. Mind you, the devil can back this up.Whatever happens, God is God and will continue to be. Be wise and dont be confused whoever has his trust/faith in God.